This is completely true and if you don't believe it I don't need to know. Well it started when I was reading about the BEP (Black Eyed People) on this website for the first time. I couldn't help but feel something as I read the stories, like there was something I couldn't remember... eventually I remembered. When I was 10 my parents accidentally left me home alone (my mum thought I was with my dad and my dad thought I was with my mum, but I was really still asleep). Anyway, I was home alone, but something told me when I woke up(not literally told me, it was like a feeling) that I should stay in my room no matter what. After about ten minutes of reading there was a knock on the door. I started to get out of bed but then I changed my mind. I looked out my window and saw a small boy. 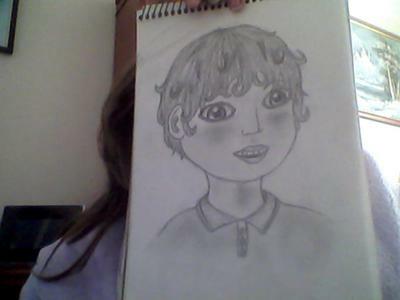 He was about 7 and had blond curly hair and scruffy clothes. That was all I could see from how far away I was. He stood on our drive and was waving at me. I gave a small wave back and laid back down. Five minutes later I looked out the window again. He was still there! This time he was sitting down next to my friend Kathleen. She was crying and he had his arm wrapped around her. At first I though it was protective, to help her feel better, but then I saw her squirm, he was hurting her. I opened my window and shouted down to Kathleen to run away, she just looked up at me her eyes were dark; not black, but dark. I hadn't seen the boy in years or Kathleen for I had changed schools and she had moved. When I was 13 I saw Kathleen again, but she was different. She walked funny, had dyed her hair black and had cut it to boy's length. Her eyes were still that dark blackish brown. She also wasn't very nice when I talked to her. That day when I went home from school, I was used to being home alone now, I heard a baby crying. It wasn't our next door neighbor because they were quite old. Then there was a knock at the door. Something told to stay still, like before it was more of a feeling. Then I was petrified at what was at my door. I had the flash of the little boy that had changed my friend forever, then it was like I was having a vision; there were hundreds of people in my living room. Some sat on the furniture and some stood, but right in the middle was a little boy. He was crying, then I noticed none of the people had any eyes, just black emptiness. The boy looked at me and said "sister... help..." then everyone vanished. The door knocked again, but I knew I couldn't let the person at the door know I was scared of him so I went to see who it was. It was a boy my age, but I had never seen him before. He wore a cap low over his face and he said: "Hi, look my phone has run out of battery can I come in and use yours?" I went to let him in but then I stopped and instead said "Here use my mobile." I handed him the mobile and he stayed outside, the then continued to say "can you come out and show me how to use it?" I grabbed back the phone and said "What 13 year old doesn't know how to use a phone?" He stomped down his foot and left. Another year has passed and I have now moved houses again, though I feel strange now. I am always scared like something is watching me. I close my curtains even if it's light outside and even though I'm not overlooked by anyone. In the pictures I take small orbs are starting to appear and I keep having strange dreams about this boy who is about 17. He comes to see me when I'm with my friends and I am always angry with him. Then he will follow me home and I would allow him inside. We would talk about things but I would never understand what we were talking about. He would always try to remind me of something I did, but I can't remember. He tells me that I killed something and I loved ripping its heart out with my bare hands, but I can't remember. Then it gets dark, in the dream, and we go outside and the first person I see I attack. It's a different person each time I have the dream, my friends, my mum, my nan. Now I am starting to have visions as well. When I walk somewhere, it always has someone that looks like me in it but I am seventeen too and there is the 17 year old boy next to me. We are always doing something horrible together and it is always at different times. I have never thought so much about this and it is really freaking me out!!! Can someone help?!!! Tell me what is going on!!! P.S - My mother sees ghosts (I'm not joking she saw my grandad and talked to him!!!) and now she is training to read tarot cards. I feel I can communicate with ghosts too but choose not to. That's wayyy too creepy and my Italian family comes from a line of good witches. My family is strange and I just want some answers!!!! Anybody have them?? ?